uuid : 931ddbce-b6e7-4e0e-bf1d-d8ba6b345d57 templates_id: 119548 templates_uuid: "68379543-662e-447c-a939-962d7e8306a8" title: "Notice of Severance - Severance of Joint Tenancy - Sever Joint Tenancy" display_name: "Notice to sever joint tenancy" meta_keywords: "Notice severing joint tenancy" description: "
Make sure you follow the proper process if you hold a property jointly with another person and you (both) want to sever this joint tenancy, with our notice of severance of joint tenancy. This joint tenancy severance is necessary to change your tenancy from a joint tenancy to a tenancy in common. This notice will record the current ownership of the property as well as the change in ownership. What is a notice to sever joint tenancy? 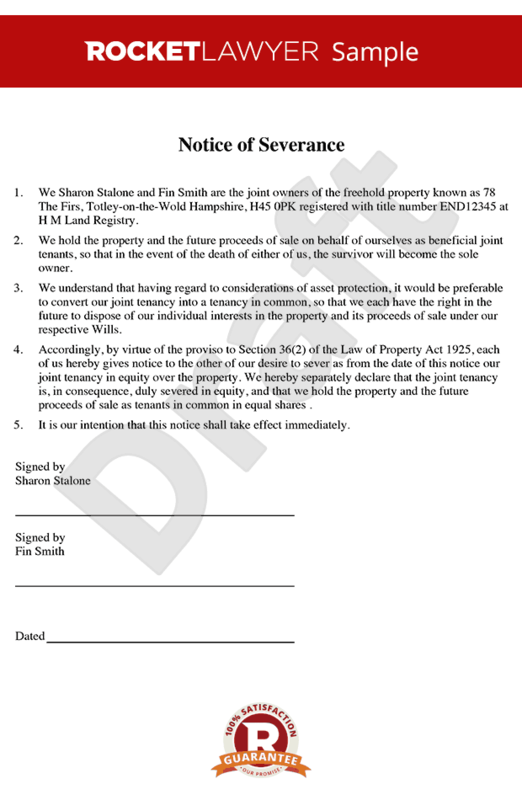 A notice of severance of joint tenancy is a document by which two or more people who own a property jointly decide to sever the joint tenancy, ie to change it to a tenancy in common. The notice outlines the current ownership status and the intended change. Why do I need a notice to sever joint tenancy? Serving a notice of severance of joint tenancy ensures you follow the proper process when you want to change the ownership status of a property. You may want to convert a joint tenancy to a tenancy in common to protect your assets, for example if you divorce and separate and want to leave your share of the property to someone else. Joint tenants have equal rights to the whole property and cannot pass on ownership of the property in their will. That means the property automatically goes to the other owners if one owner dies. Tenants in common can own different shares of the property and can pass on their share of the property in their will. The property doesn\302\222t automatically go to the other owners if one owner dies. When is the severance effective? The severance of joint tenancy is effective from the date of the notice. What\'s the next step after issuing the notice of severance? If the property is registered at the Land Registry, you need to register the change with the Land Registry. To do so, you\'ll need to apply for a Form A restriction. This notice to sever joint tenancy is governed by the law of England and Wales. \r\n\r\n \r\n Ask a lawyer\r\n to discuss your specific legal situation.\r\n " created_timestamp: "2018-10-08 04:36:51.0" modified_timestamp: "2018-10-08 04:36:51.0" active: true created_by: 104 modified_by: 104 dcm_id: 279 url_slug: "Notice-to-sever-joint-tenancy" meta_description: "Prepare a notice of severance of a joint tenancy with simple guidance from Rocket Lawyer. If you hold a property jointly with another person and you (both) want to sever the tenancy, try this severance of joint tenancy for free. " time_to_complete: "10 minutes"
Tenants in common can own different shares of the property and can pass on their share of the property in their will. The property doesnt automatically go to the other owners if one owner dies. What's the next step after issuing the notice of severance? If the property is registered at the Land Registry, you need to register the change with the Land Registry. To do so, you'll need to apply for a Form A restriction. Ask a lawyer to discuss your specific legal situation. More than just a Notice to sever joint tenancy template, our step-by-step interview and guidance makes it easy to create your document. Easily create online, download, print and sign your free Notice to sever joint tenancy in minutes. This document is also sometimes called: Notice severing joint tenancy.